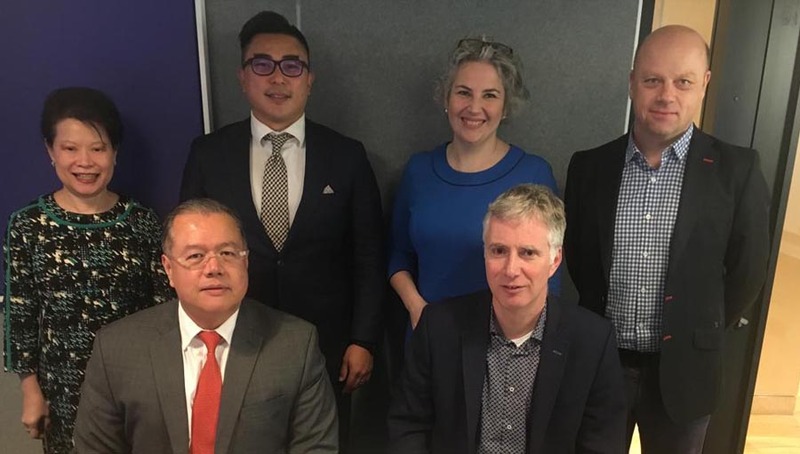 The IAPB Council of Members 2018 was a new and exciting opportunity for members to meet, take part in member-led sessions and to connect with new partners. We’d like to thank the teams at L V Prasad Eye Institute and the Gullapalli Pratibha Rao International Centre for Advancement of Rural Eye Care (GPR ICARE) for hosting the Council of Members and Committee, work group and Board meetings. We would also like to congratulate them on the 20thanniversary of GPR ICARE. Drs Nag Rao and Rohit Khanna also helped with the logistics and in planning the programme for the Council. One of the themes of the Council has been integrating eye care into broader health systems. The presence and vocal support of the Ministers of Health from India and Liberia, and other government officials at the event really underscored their commitment to eye health and India’s approaches to including eye care in their health care packages to citizens. The IAPB Council’s themes were: Learn, Connect, Advocate, Trend. We hope the sessions and the social opportunities allowed you to do all this and more! Do let us know what you liked (or didn’t), it will help us plan for the future. The mornings began with our popular breakfast sessions: Day 1 saw an introduction to IAPB membership, and the Our Children’s Vision’s session on advocacy models for children’s vision services. The IAPB team, including Vice President Victoria Sheffield and Membership & Fundraising Officer Emma Foote, discussed IAPB’s workgroups and engagement strategies. The OCV team announced that they had reached out to 27 million children–an extraordinary achievement! On Day 2, The session by the Lions Clubs International Foundation elicited a lot of interest as Gillian Gibbs (Manager Sight Partnerships, LCIF) and Emily Johnson (Regional Program Specialist Asia/Pacfic, LCIF) and the SightFirst Regional Technical Advisors spoke about the LCIF grant process and what kind of proposals they are looking for. A parallel session discussed gender equity (see below). Our lunch sessions were packed too! From a discussion on the Rohingya refugees, a review of the USAID child Blindness grant programme, to a discussion of West Pacific activities, a discussion of the recent RCT on uptake of eyeglasses among workers and Seeing is Believing, we had them all. The opening session began with Dr Alarcos Cieza, Coordinator, Disability and Rehabilitation at the WHO, highlighting the building momentum around eye health services and their integration into UHC. She called on the IAPB membership to think of fresh ideas to keep the momentum going. IAPB’s CEO Peter Holland showcased the big numbers and their all-too-human impact. He talked about national and state-level UHC programmes that included eye health, and promised to work with the membership to encourage other countries to do the same. 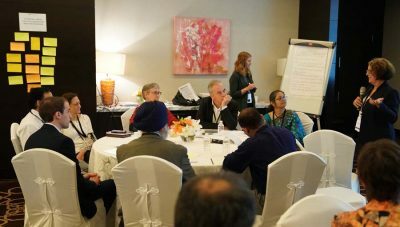 The Lions Club International Foundation (LCIF) sponsored and ran a session which focused on building new, and maintaining successful partnerships. During IAPB CEO Peter Holland’s recent member calls, members asked IAPB to find new ways for them to connect and for IAPB to facilitate the conversation. The session was a fantastic opportunity to foster such discussions. What makes an effective partnership? What are the potential areas for collaboration? Here’s another popular theme from our member calls: Emerging technologies in eye care. The session was led by some of the leaders in technology-mediated eye care: Aravind Eye Care System and LVPEI. These hospitals have partnered with Google and Microsoft’s machine learning and AI teams on various projects, and the session included a presentation from Microsoft’s Subrata Roychoudhuri. Subrata showcased Microsoft’s work in Patient care and Patient Access. Microsoft, for example, is developing APIs for retinal imaging and even AI assistants that help clinicans identify disease. He also discussed technology-supported patient access—AI-assisted medical intelligence, chat bots and other systems-related software. Anthony Vipin Das discussed LVPEI’s various forays into technology-mediated eye care practice and delivery. This included their in-house Electronic Medical Record (EMR) software, which includes an app module for tablet-based data-capture from primary centres and data dashboards; their different approaches to tele-ophthalmology and some cool training aids, like their mixed-reality, holo-lens powered 3D eye anatomy. Dhivya Ramasamy showcased Aravind Eye Care System’s tools for technology-assisted training and the various resources they have available for online learning, including e-books and competency modules. The highlight included an app to help students literally map their progress for achieving different levels of competency. The session was followed by an interesting Q and A session. The plenary session on DR opened with Brandon Ah Tong from the Fred Hollows Foundation launching the “global compendium of good practice: Integrated care for diabetes and eye health”. This pulls together a range of case studies from around the world showing good practices in integrated care for diabetes and eye health. The panel was chaired by Dr Nikhil Tandon from the All India Institute of Medical Sciences who ably led the discussions that touched upon the situation in India, Bangladesh and even in high-income countries like Australia. Dr Zareen Khair, Country Manager FHF, Bangladesh shared innovative approaches to integrated care for DR that have worked in Bangladesh. Questions and discussions ranged on topics like whether a PPP model works for DR, what needs to be done to achieve Universal Health Coverage, training and more. Examples were given of programmes that the Queen Elizabeth Diamond Jubilee Trust is funding in India and in Bangladesh. During the Q/A session Prof Hugh Taylor spoke about the need to emphasize eye care for people with diabetes, not just for DR but also for refraction and cataract services , for which they are at risk. This session, sponsored by the Fred Hollows Foundation, looked at Universal Health Coverage, Health Financing Systems and the different ways health services are financed. Sightsavers India shared some research they had undertaken in patient willingness to pay for services, and the variables which affect this, e.g. gender, education level, age, income level. Participants were also encouraged to think about what stages different countries were in their UCH roll out, and how NGOs can support this process. This session, led by Jennifer Gersbeck, The Fred Hollows Foundation and Amanda Davis, Brien Holden Vision Institute Foundation, began by sharing the data from the IAPB Vision Atlas that 55% of visually impaired people are women. The speakers discussed what data is missing, as well as some of the barriers for women accessing services. 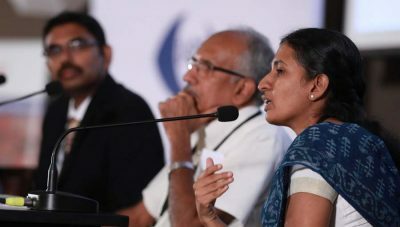 A case study was shared from India on an example of working with men & boys in India on gender equality, with some key success strategies shared with the group. The session also discussed the importance of linking in with other gender specialists (from other sectors). The speakers informed people that the IAPB Gender Equity Working Group are currently working on a Gender Toolkit, and received suggestions from participants on the purpose, audience & areas a Toolkit should cover. 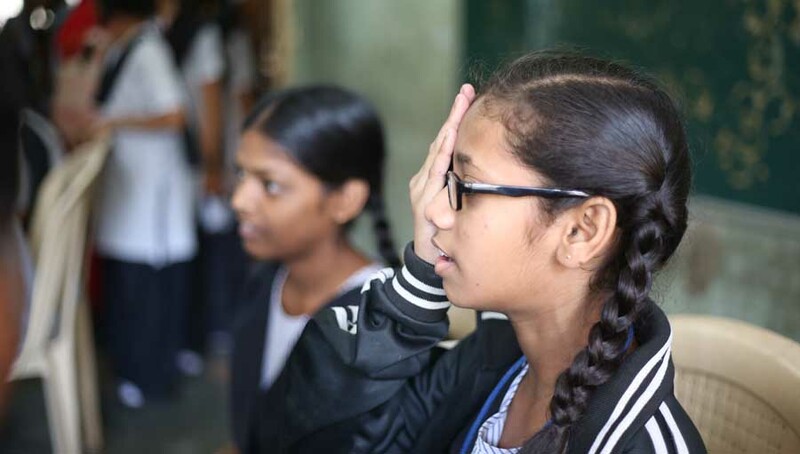 This session, with support from the Brien Holden Vision Institute, gave an outline of the new Standard Guidelines for Comprehensive School Eye Health Programmes, which have been developed by the IAPB School Eye Health Working Group. 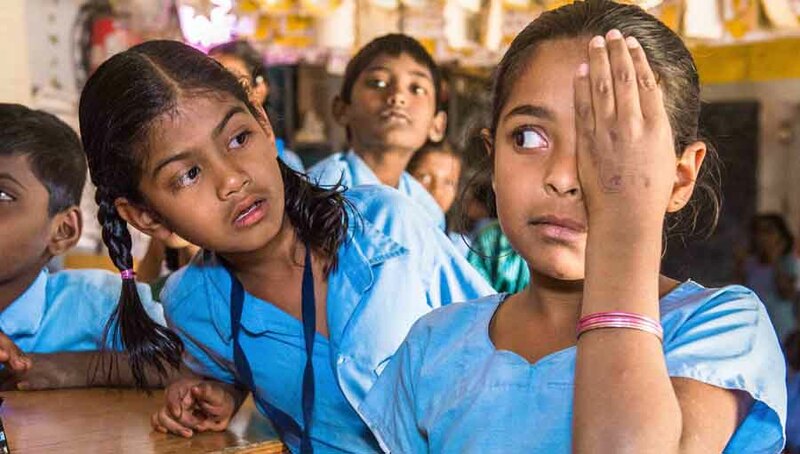 The Guidelines cover: the need for school eye health; comprehensive school eye health; Steps in planning school health; Determine the Goal of the programme and delineate the causal pathways to achieve the goal; Guidelines for implementation; Training; and Technology guidelines. This session began by providing an evolution of low vision as part of Comprehensive Eye Care. The speakers gave an overview of the Patient & Practitioner issues in low vision services. LVPEI described the challenges in providing low vision services in India, as well as some of the strategies they use to encourage uptake, e.g. education on the benefit of services. Some of the Key Resources for Low Vision were highlighted, such as, a map showing the access of people with low vision to low vision services globally; the WHO Tool for assessment of rehabilitation services and systems; The IAPB Essential List on Low Vision; and the Hong Kong Society for the Blind low vision resource centre. 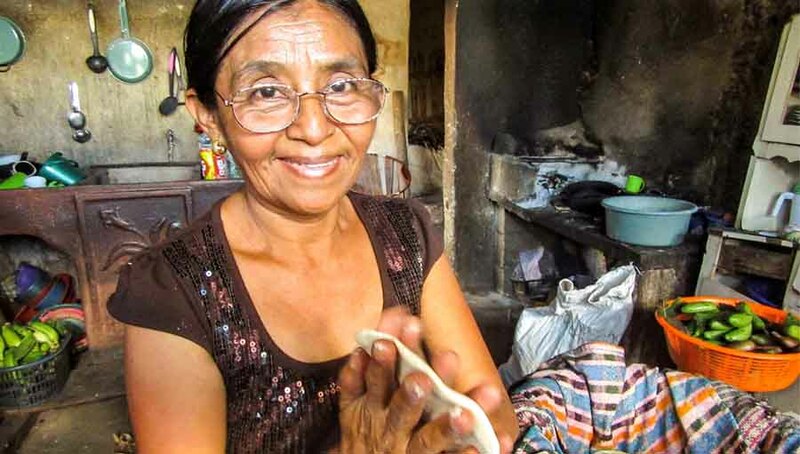 The Eye Health Heroes initiative recognizes and celebrates frontline staff whose work in the field and engagement with the community makes a real difference in restoring sight. This year’s Eye Health Heroes took to the stage on the Sunday afternoon, and presented on topics, challenges and work they are involved in. They later received their awards to standing ovations and cheers from the eye health community. We look forward to hearing more from our Heroes over the coming weeks (See all Hero photos from the event, here). Did you visit us at the IAPB Hub? We’re in the process of following up soon on all of the membership enquires, webinar concepts and partnership opportunities. 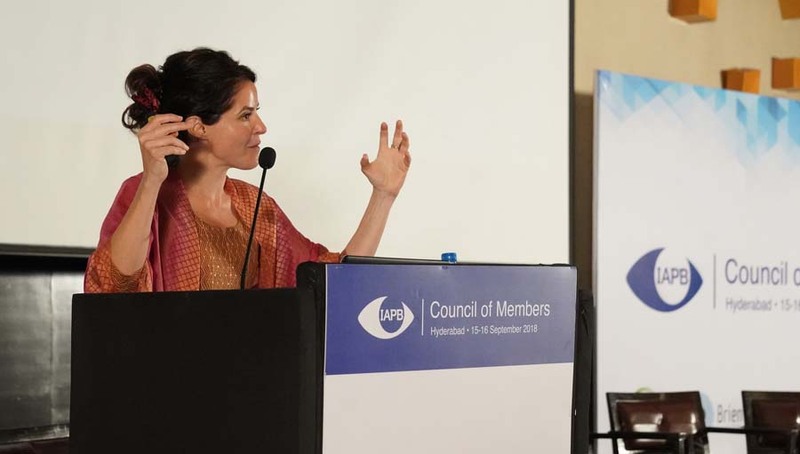 The main feature of the Hub was the IAPB Membership Map which will be published around World Sight Day, and will give a blueprint of where members are working and who to contact in that country. The vital support of our sponsors has made this year’s Council of Members possible. 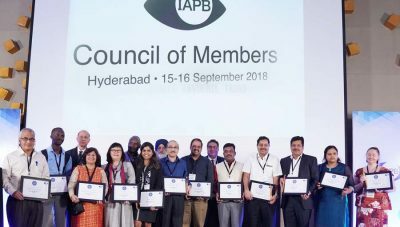 Thanks to them, IAPB has been able to create more opportunities for members to learn, connect and convene. Our sponsors also brought their expert knowledge to the Council and we would like to thank the Lions Club International Foundation, The Fred Hollows Foundation, Bayer, Brien Holden Vision Institute and Standard Chartered Bank/Seeing is Believing. We would also like to thank our exhibitors whose attendance brings expertise from outside of the NGO sector and offers delegates a chance to explore their innovations. Thanks to: Appasamy, Aurolab, Deepak Care, Forus Health, Global Vision 2020, Keeler, Omni Lens, Pellucid, Plusoptix, Remidio, Ziess and 2.5 New Vision Generation. “I am very grateful to our sponsors and exhibitors—this event would not have been a success without their support. Their presence had embellished the Council’s programme and I look forward to seeing them again next year”, said Joanna Conlon, Director of Development and Communications.